I just received my second Triad handle from Toby. 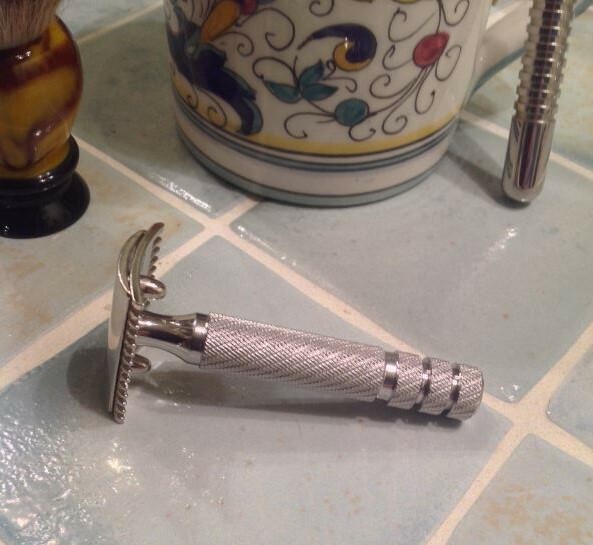 It is gorgeous; the accompanying picture shows it hooked up to a Gillette 1920s Old Type with a 102A cap. It feels perfect in the hand - the knurling is crisp and deep. I think Toby referred to it an Aristocrat-style knurling. It is just about the same size as a Webber Bulldog and fits perfectly in the leather travel wallet the Sanch made last year. I will have to wait until tomorrow to shave with it (written with one hand as I caress today's BBS shave still smooth after almost 10 hours). I'll lay in a new Feather and let you know how it went. My other Triad is longer, wider, and heavier and is usually mated to a mid-30s Long Comb NEW, but I am looking forward to this new combination tomorrow. I am delighted to know this kind of craftsmanship is happening here, by request, and in a very fast manner! Gorgeous ! Have fun with it! Congratulations! Toby makes beautiful handles. He's a true artist. Hope you have many wonderful shaves with it. Congratulations on a beautiful handle! Congrats on a great looking handle. That is a fantastic looking handle. Very nice! Very, very beautiful! Congrats on this! I cannot wait to get a couple handles from Toby. Have a Triad handle that looks like a crank shaft on my new Mongoose and love it. Great workmanship and a pleasure to deal with.